Best Watford game of last 20 years? Discussion in 'The Hornets' Nest - Watford Chat' started by ITK platypus, Apr 8, 2019. Perfect Sky or Between Two Lovers? Definitely one of the best results, but best game would I think be where we didn't have to come back from two goals Down! Definitely yesterday. So much more at stake, bigger stage, classier goals and the team had work so hard to earn the right to win from 0-2. As a single moment I doubt anything will top Deeney's goal against Leicester - though a winner on 18th May might. By best game do you mean best performance or the best moment? One of the top 5 moments in the Pozzo era. We've had some down the years though, I think you have to add both Bolton and Leeds play off finals to the list. Happy bunny and lendal like this. Don't think I agree with that, surely promotion to the PL is worth more than getting to the Cup Final? Appreciate it didn't pan out like that but at the time we never knew. Brighton away 2-0 and the afternoon that followed as we got promotion. How many matches from August 2011 to present day would get in there? 31/03/12 2-0 at Leeds, Iwelumo double. 12/05/13 3-1 v Leicester, Deeney day. 09/08/14 3-0 v Bolton, as perfect opening day as you'll get. 30/08/14 4-2 v Huddersfield, Saninno's last match but down to 10 men but I felt that this was going to be our season. 05/12/14 5-0 at Fulham, my son's first away game! 14/02/15 4-3 at Bolton - these two games we just never gave up. 06/04/15 2-0 v Middlesbrough, put the hoodoo of not beating another top 6 club to bed. 25/04/15 2-0 at Brighton, promotion day. Any more that I've missed? That's 27 I've included that would have been worthy of the book in my opinion. Jlappy, Rozerhorn, ITK platypus and 2 others like this. Yesterday sits just above Leicester for me simply because it was a momentous moment of how far the fan base has come. 1881 has transformed the experience of following the club and to totally outsing a club like Wolves is good going. Happy bunny, Lionel Fessi, lendal and 1 other person like this. Yesterday and the Play off semi final against Leicester. Both swung on Michael Oliver last minutes penalties. Ultimately we lost to Palace in the final so it's slightly tarnished as it didn't mean much in the end. Getting to an FA Cup final in the way we did, has to make it arguably the most special match of our history. Beating Bolton and Leeds in play off finals were fantastic, but again, it led to just one season in the Premier League before we found ourselves back in the Championship. Beating Plymouth in '84 to get us into our first ever final was great, but it was expected. It would have been a major giant killing had we lost that. Ok, we may lose the final, but we've made it to a final when we are all but out. We're going to be part of the biggest domestic cup match in England, so that's very special in itself. It will part of our honours list, be it runners-up or winners. EB Hornet, scummybear, Hogg-DEENEY!!! and 1 other person like this. Well I suppose the fair comparison would be to compare a promotion with actually winning the thing, as both were semis. Either way, we've all seen our fair share of promotions, and I'm sure there'll be more when we eventually do get relegated next season (), but **** knows when the next cup final will be? Will be the first time I and many others will have seen the 'Orns in a cup final! Wembley 1999 the best of the lot for me. wfc4ever, Lionel Fessi, La_tempesta_cielo_68 and 2 others like this. Getting revenge on that little cheating twerp Knockaert, the justice of it, resonates with me. Still v Leicester for me, although there are some strong similarities between the two games. I was also absolutely, completely and totally convinced we were out of the playoffs in the Leicester game; at 2-0 yesterday with 11 minutes to go, the balance of play was such that I could see us equalizing. I tend to disagree with those who feel the Leicester result didn't matter in the end because we lost the final; for me, football is about moments and games, not outcomes. To me, that line of thinking is like saying life doesn't matter because we all die in the end. The Leicester game stands on its own merits. It's fair to say it would have been enhanced by a final victory, but it was still a legendary game as individual games go. Everyone who watched that match will remember how they felt as events unfolded (and that includes the poor Leicester fans). If the only thing that matters is the eventual outcome we might as well just liquidate every club outside the big 6. Forzainglese, Davidmsawyer, Rozerhorn and 7 others like this. Still think yesterday was better, but an excellent point, well noted! Wolves for me. Such a big prize at the end of it. Maybe consider a change of name then? luther1, Lionel Fessi, sydney_horn and 1 other person like this. Agreed. Yes, our comeback from 0-5 down with only 2 mins left on 18/5 will top the lot. The Deeney moment was just that, a moment not a match, so yesterday was better. But 1999 was the best of all, not least for what it meant to GT. Exactly. It was GT's redemption after all those years of mockery, and it was glorious. Forzainglese, Hogg-DEENEY!! !, Happy bunny and 1 other person like this. I think we are all perhaps guilty of not giving enough respect or mention to Cardiff 06 nowadays, effortlessly dispatching Leeds in the manner in which we did was also an incredible achievement that day. MarlonsCellMate, Rozerhorn, V Crabro and 5 others like this. too easy and a match devoid of quality. Absolutely. I think it gets overlooked because the result just never seemed in doubt. We smashed them from start to finish. Leeds absolutely bottled it, no question. Yep, we nearly scored in the very first minute if I remember rightly (or close to it). 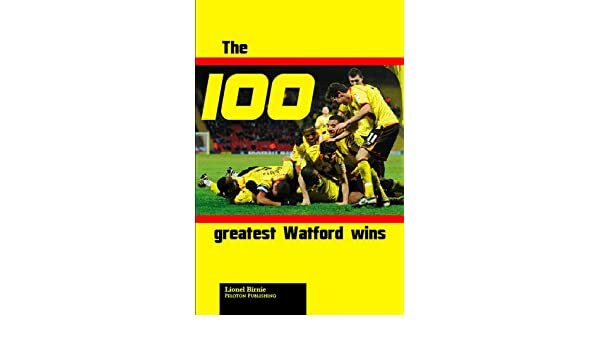 Absolutely, not taking anything away from the 1999 victory, but I'm surprised enough that most people put it above Bolton in greatest Watford games, let alone rarely even giving it a mention. For me, that game is better because it sealed an even more unexpected promotion and brilliant play-off run where we cruised past Palace and Leeds without conceding a goal, and a better and more consistent season than 1998/99 with better football. But I supposedly most people look back more fondly on the earlier season because GT is god and it was his long-awaited return after years of stagnation at the club, and the way Aidy turned out diminishes the glories of the 2005/06 season for some. We dared to dream after 1999. In 2006 we knew we were in for nothing more than a season full of frightful beatings. The 2006 final was superb. We utterly outclassed a dreary Leeds side on a massive occasion to clinch an unexpected promotion- regardless of what followed it was an amazing day that tends to get unfairly overlooked. However the 99 final was easily on a par with that; it was an astonishing achievement really. Ultimately though I’d plump for the Leicester game. The whole game was such an incredible spectacle which had the most magical moment I’ve ever witnessed in football as a climax. It was the birth of a new era, the writing of Troy into Watford folklore and still gives me goosebumps whenever I watch it. Yesterday’s game was definitely up there though, and the stage and the significance of the game may be altered by the result in the final. We won’t stage a comeback like that against City; we’ll be fortunate to escape with a scrappy 1-1 or a win on penalties. There’s every chance we get beaten 5-0. So this will be the best game we play in the FA Cup this season and possibly ever. I voted for other. It was definitely that 0-0 loss on penalties to accrington stanley in the league cup second round at the vic after extra time, some time in the mid 00s. A dull 0-0 against City, followed by a win on penalties, would represent the greatest moment in the club’s history, be remembered for ever and no-one would care what the game was like. wfcmoog and Happy bunny like this. Nobody has mentioned the turnaround at home to Kaiserslautern or the 2-1 win over champions Liverpool which clinched our runners-up place in the top tier, with Martin Patching playing a blinder and scoring in what was expected to be his last game. Very reasonable list, good to see Leeds so high, but I'm not sure Plymouth should be above them, as it was more about Watford making history than the match itself - although I didn't see the game, a narrow win against a struggling third division side in a match we were overwhelming favourites to win suggests it wasn't exactly a classic. Forgotten about Levski Spartak, but this was well before my time as a WFC fan. All the ones I would expect to be in the list (including Kaiserslautern and Southampton) are there. Unfortunately this thread is about Watford games from the last 20 years - not even the 4-0 at the Kennel would make it, though it sure doesn't seem like more than 20 years ago!